Now, given the fact that I (and at least a handful of others) witness this sort of chaos every day while driving on most major Metro Manila thoroughfares, would you really say that Mr. Inton’s proposal is the best? One is compelled to think how much LTFRB officials earn by protecting the interests of these bus operators. In the midst of this chaos, not once have I seen any of these bus drivers and operators pay the penalty for clogging up Metro Manila’s major highways. 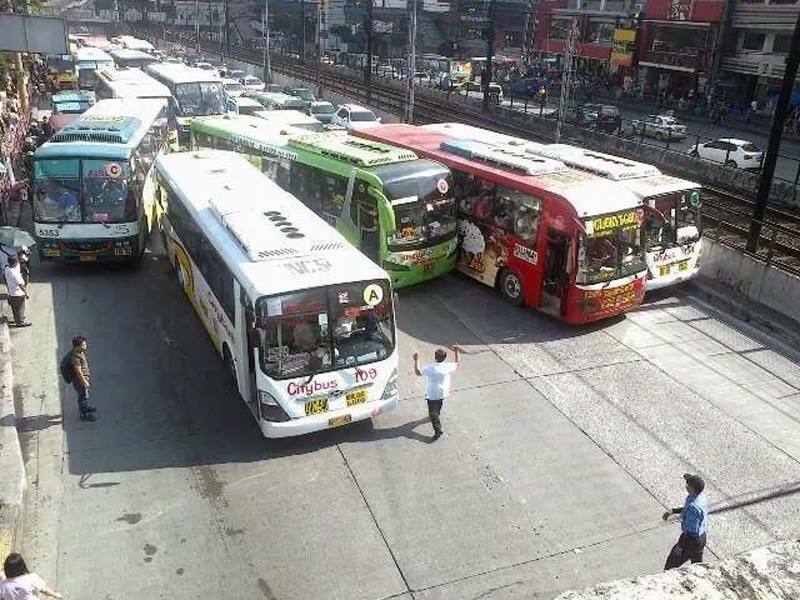 From my perspective, it seems that every person supposed to be in charge of organizing Metro Manila traffic (from the level of the lowest-ranking LTFRB, MMDA, and local traffic enforcement lackey up to their top brass) is keen on preying upon private motorists for the slightest infraction yet they would never tangle with the perennial traffic violators driving buses and jeepneys. That’s concrete evidence of impunity in Philippine culture, folks! I’d like to add as well that it simply is idiocy to propose solutions that don’t address the problems that are clearly seen. Get rid of all the colorum (i.e. illegal) buses. Phase out the jeepney (Why should we keep on using antiquated technology?). Implelement strict public transport schedules that could be found in various developed nations. Upgrade the present railway system. Implement traffic rules and regulations to the letter of the law. Now, I understand that given the hypersensitive hair-trigger temper of my fellow countrymen (“balat sibuyas”), many will object to such suggestions which, I would admit, are not in any way unique. Such objections are the result of many things not limited to preference to the status quo, resistance to change, and resistance to any exercise in disciplined and organized behavior (as evidenced by the aversion to following rules such as the use of pedestrian walkways, a topic for another time). I also understand that implementing changes involves systemic revision, hence it is in no way easy. However, we have to start somewhere. The realization that a cultural change should happen has been long overdue hence this rather small reminder in cyberspace that the Filipino needs to shape up if it wants to deserve the sort of pride it desperately clings on to. Perhaps it’s about time by starting to change how we Filipinos behave while we’re on public streets. If we Filipinos, as a culture, persist on keeping such chaos described above as the norm, we’re just demonstrating to the world the prevalence of idiocy in our country. It’s been so long since I last posted something here as I was very busy with graduate school activities and work as usual. I find it refreshing that I got some time now to write something. This past week, I completed a 10-minute piece which I submitted to my composition teacher, Dr. Kristina Benitez, and got some useful feedback from her. This coming trimester, my new task is to expand that piece into a multi-movement suite. Expanding it into a suite is very doable since that piece has a lot of ideas going on. The next question now is whether or not I can get it performed or at least be able to record a good mockup of it. Because of that, I started to explore the Sibelius 7 Sound Library. These past few days, I was occupied with testing out the Sibelius 7 Sound Library on my MacBook Pro, and so I decided to dig up my musical history. I’m not very fond of listening to the old stuff I’ve written and recorded since it feels very much like reading your high school diary (the thought of which makes me cringe). However, in this case I wanted to hear what it would be like to try out my old compositions on a new sample library. I use a number of sample libraries in my music production in various formats like NI Kontakt, Apple EXS24, etc. and I also used to have the old Sibelius 5 sound library. I was quite fond of it when it came out (even though it was far from perfect), and so it was very exciting for me to use that new library for the first time. Hearing my old, old works on new sounds gave it new life. It still sounds far from perfect of course but the Sibelius 7 Sounds are usable to create orchestral mockups. The percussion and piano sounds were excellent although the tremolo is still has that slight machine gun effect. The other samples like strings, woodwinds, and brass are okay. As with many sample libraries, I found the guitar samples to be less than satisfying. The classical guitar samples could have been good except that it can be oddly squeaky because of the default fret noise setting. Imagine hearing playing single scale notes with every note being accompanied by a fret squeak, and so it sounds so unnatural. The solution to that would be to dial down the fret noise knob. Steel string guitar sounds are okay. The distorted guitar sound is probably the most awful of the bunch. It’s a good thing that I’m a guitarist as well and so I wouldn’t need to use those guitar samples anyway. I said a while ago that I’m not fond of listening to my old recordings but I did find something good about that little exercise. I was able to uncover musical ideas that I would call diamonds in the rough. Bits and pieces of melodic and rhythmic themes here and there would make good material to expand for a variety of compositions that I could craft in the near future. I just hope that I get the time and patience to further explore them. So, going back to my graduate school composition work, I plan to expand that into a suite. I should probably start once the weekday hits, or maybe I should talk to Dr. Benitez first to plan it all out. After scoring it in Sibelius, I will tweak the hell out of the MIDI to make it somewhat realistic and then practice all guitar, iPad, and piano parts before recording. That should enable me to submit a good recording by the end of the term. Afterwards, it will be time to work on my graduate thesis. Seems like I should savor these light-load days as I will be very busy in the next few months . Is Jazz dead? Depends on where you live. In the Philippines, it’s barely surviving, no thanks to local mass media, many of which are hell bent on keeping people stupid with anti-neuron “music” and TV shows. However, artists like Johnny Alegre and the Tomodachi Trio along with places like Tiendesitas try as much as they can to keep it alive. In the place where I serve, I’m the only guy who’s seriously into jazz, my bandmates know of it on a superficial level, and the rest of the folks attending the services have little idea of it. The way things go with the music industry nowadays, it is probably hanging on for dear life even in its birthplace, the U.S. of A. although because of its cultural value it might continue to live on. In places like the university where I attend, some semblance of it still lives through the popular music courses being offered. Unfortunately, we don’t do jazz in graduate school. I asked the dean numerous times if we had a jazz major or elective since I was interested. The reply was negative. 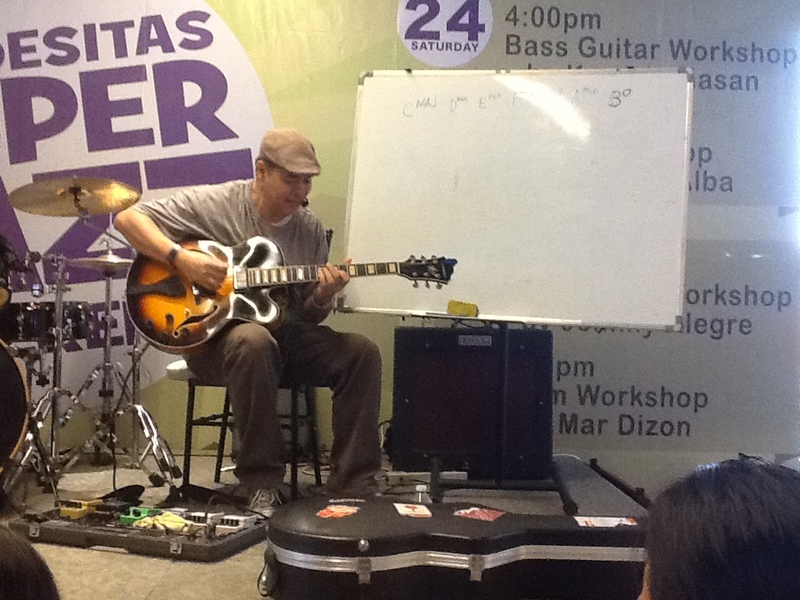 Around 3 p.m. last Sunday (May 25, 2014), I stopped by Tiendesitas to attend a very much anticipated jazz guitar workshop. This jazz guitar workshop was facilitated by none other than one of the top jazz guitar heroes of the Philippines, Mr. Johnny Alegre. I’ve heard of Sir Johnny around the late 90s, but I became acquainted with his work through his CD “Eastern Skies”. The blend of jazz guitar and the sounds of the Global Studio Orchestra (conducted by Gerard Salonga) was captivating to say the least, and I wondered how Sir Johnny was able to do his thing. This afternoon’s event was a chance I took to somehow find out how he thinks musically as well as gain some useful information to improve my jazz composition and piano/guitar skills. Play in time. Have good timing. Strive for the right tone. Listen to great works of music. The workshop had discussions ranging from some of the most basic topics such as getting in tune and scale shapes to more advanced discussions of jazz theory such as modes and the impact of Latin American music. In terms of jazz guitar playing and composition, one of the points that greatly captured my interest was Sir Johnny’s discussion and demonstration about modal interchange and secondary dominants. Why is it such a big deal? It is because it explained a lot of things such as playing minor pentatonic or the Dorian mode over a major blues chord progression, “out there” soloing, the use of color/passing/approach tones, and other stuff that makes jazz sound like what it is. Modal interchange and secondary dominants make perfect sense as to how many jazz pieces (bebop and modal jazz in particular) start at a particular key signature, drift in and out of different key signatures, and then end right back at the original key signature without sounding jarring like a 20th-century serial composition (Ascension-era John Coltrane is a different case for another discussion). Sir Johnny’s words regarding the matter had confirmed what I have been hearing and trying to do before: Modal interchange has big implications not only in the way we approach soloing but also in reharmonization and composition. The seminar sort of felt like most of my jazz theory discussions with pianist Steve Nixon, with the exception that this time it’s about jazz guitar. I have been learning jazz through a pianist’s perspective for most of my life as a musician, but this afternoon was the first time that I was able to learn jazz directly from a guitarist’s perspective. For years I have done work to try and understand the theory of jazz through a piano keyboard and have been trying to transfer that knowledge through the guitar. Thanks to Sir Johnny’;s workshop, I was able to confirm that I must be doing something right with all that experimentation and self-learning. More than that, I now have some understanding as to how Johnny Alegre approaches jazz guitar and this big musical language called jazz itself. Would I say that the workshop was a success? I would say yes simply because my understanding of how and why jazz guitar is what it is has improved vastly thanks to Sir Johnny. So, how did it all end for me? Well, like a star-struck fanboy, I fumbled around thanking the man for the stuff I learned and I asked permission to publish this post (with snippets of the recording and photos). As star-struck as I am, I forgot to introduce myself properly, despite trying to converse with him three times, and I forgot to purchase his latest album (which I will BTW) despite having prepared some cash for it. I even made an embarrassment of myself by asking, “What was that piece you played at the end?” only for him and another member of the audience to tell me that it’s Stevie Wonder’s “You Are the Sunshine of My Life” in a tone that seemed like, “Isn’t it obvious that Johnny’s playing ‘You Are the Sunshine of My Life’? Duh…” Oh well, if I do meet him again, I’ll take note of these things and hope to be a bit more composed and refined in the way I conduct myself in front of him. If time permits (and if I am allowed to do so), yours truly will transcribe some of examples Sir Johnny performed in the workshop and make them available here (in standard notation and tab). Watch out for Part 2 of this piece as I try to retell some of the things I have learned from Mr. Johnny Alegre. For more information about Johnny Alegre, his latest and past albums, and his other projects, please visit this Facebook page or his website.